Along with the magnificent five mile stretch of safe beach, Filey offers surfing, fishing, walking, yachting, golfing and bird watching. The beach is protected by the Filey Brigg, which is a haven for a variety of birds and wildlife. 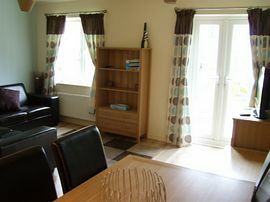 Built on the old Butlins site near Filey, this luxury central heated house, is part of a very prestigious development of holiday homes. One of the only holiday resorts on this coast, where you can walk to the beach within the complex. The downstairs consists of a hallway leading from the front door to the open plan kitchen, dinner and living room. 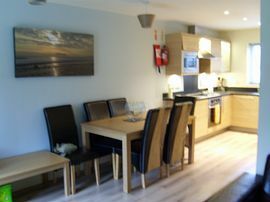 The kitchen is equipped to a very high standard with a fridge freezer, cooker with ceramic 4 ring hob, extractor fan, microwave, dishwasher, washing machine / drier, toaster, kettle, all plates, glasses, pots, pans, cutlery etc. The dining room has a rectangular table with six leather and suede chairs. The L shaped lounge has two, two seater leather settees, corner drinks table, coffee table, unit and TV stand with large 32 inch remote LCD colour Freview TV. The lounge leads to the patio area through french doors, where there is a wooden table and four chairs. There is a downstairs toilet. Downstairs is all hard wooden flooring. Upstairs is fully carpeted. The master bedroom has a double bed, with leather headboard and surround and bedside cabinets, draws and a slide double wardrobe with TV and freeview. The smaller second bedroom has two single beds, two side cabinets, built in wardrobe. 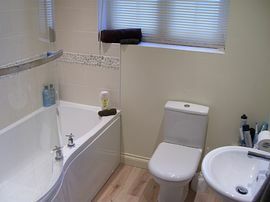 The bathroom is finished with a tiled floor and walls, lovely modern sink and toilet with soft fall seat. There is a bath with built in shower, spotlights and extractor fan. Fantastic Easy Access to beach. Local Services: Public House with restaurant and Chemist. 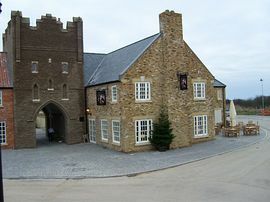 Take the A165 from Bridlington or Scarborough and 'The Bay Filey' Development is off Moor Road near Filey. 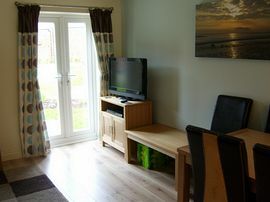 All year - short breaks available. Miss Walker of Eston, Cleveland - Lovely house cannot wait to come back again.